We have a great new tangle - rixty. CZTs Linda Cobb and Linda Halvorsen are organizing an effort to get the attention of CBS's "Sunday Morning" program. Details on that below. 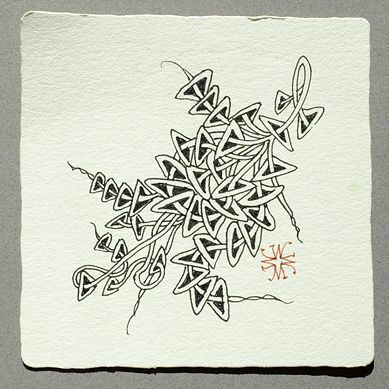 Zentangle 10th Anniversary coming up! 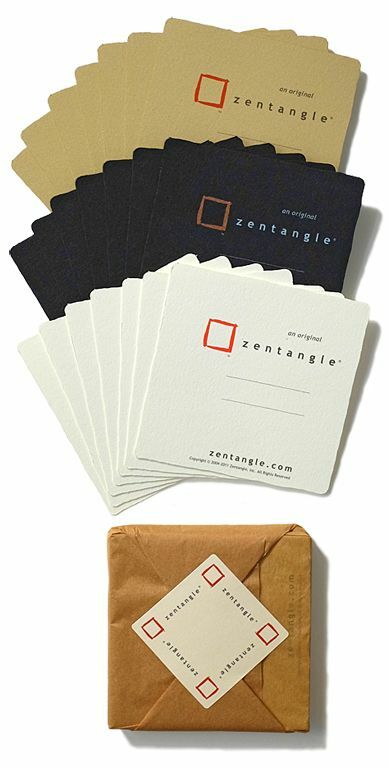 We're now offering a 7∙7∙7 sampler of 21 square tiles: seven white, seven black and seven tan. As we all patiently (well, maybe some of us) await the promise of spring and all the wonders it brings, we want to share with all of you the gift I gave Rick for his 60th birthday that we recently celebrated. Wow! Can we really be that old? Someone once told me that the definition of "old" is 10 years older than whatever your age is. That sounds about right. Creating this new tangle was more difficult than usual. 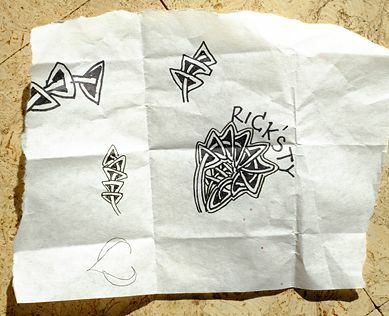 As most of you know, Rick sort of gravitates towards straight line tangles and I, on the other hand, am a bit on the curvy side . . .
Our daughter Martha came up with the name rixty. Pretty cool, I think. Maria started to give me my birthday present in a restaurant during a family get-together for my 60th birthday. Fortunately the tables had paper coverings! We tore off a piece for a memento. 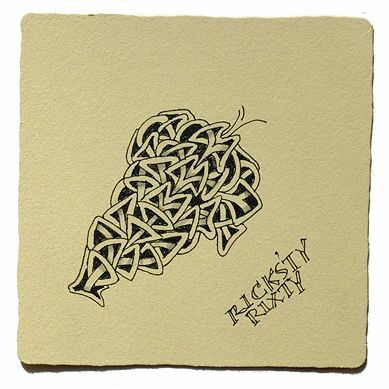 Originally we were spelling this tangle's name "ricksty" but soon changed it to "rixty." Our grandsons, Ramsey and Wyatt, each helped "unwrap" my birthday gift! Here are some more wonderful ideas of the places you can go with rixty. 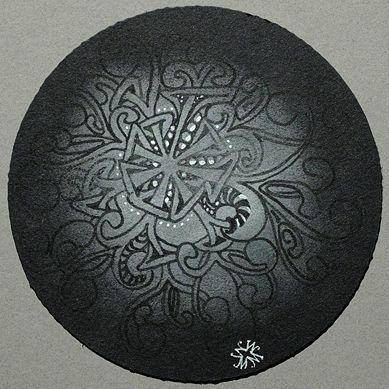 In this next one, Maria first "dusted" the black Zendala with Zenstone shavings. Then she tangled it with a Sakura� Pigma™ Graphic 1. And I also got a chance explore my present! 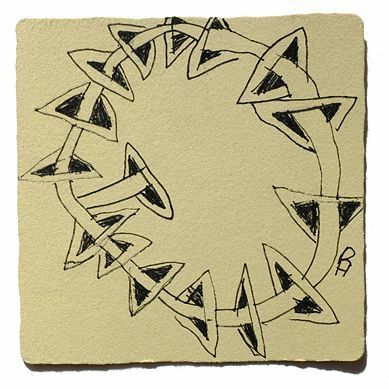 Rixty is a fun, simple and dynamic tangle. Particularly when it's clustered tight together, its step out is not intuitively obvious. 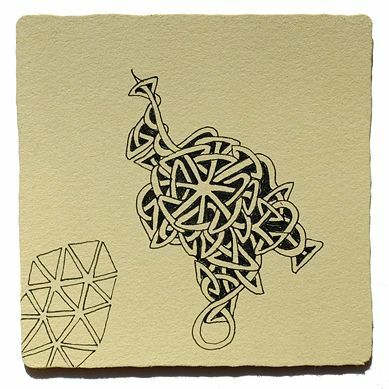 It's another Zentangle "magic trick"! We're going to wait a couple weeks or so to share rixty's step out. 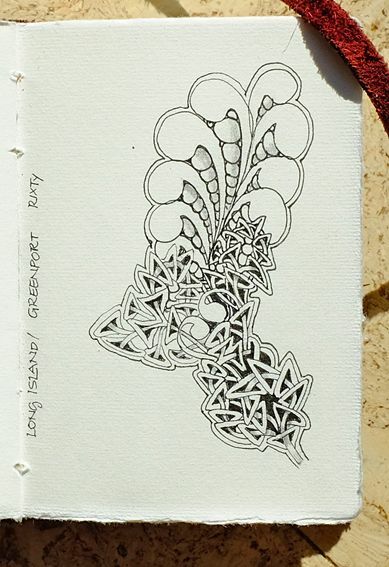 You have a(nother) good reason to take a workshop from a Certified Zentangle Teacher (CZT) . . . because we've shown them the step out. 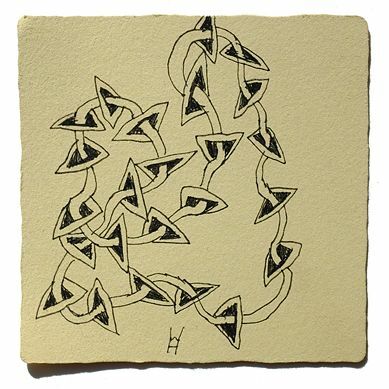 You have a chance to ponder how YOU might deconstruct this pattern to most easily tangle it. You may come up with a more elegant step out than if we just showed you ours! 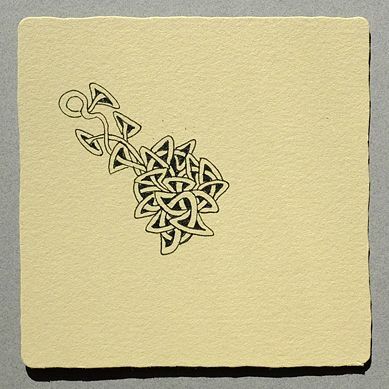 For people who want to try out all our Zentangle tile paper choices, we created a sampler. 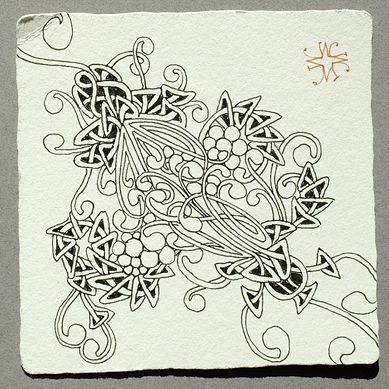 This collection of 3.5 inch Zentangle tiles includes seven white tiles, seven black tiles and seven tan tiles. 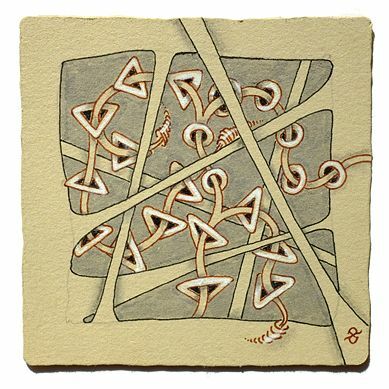 Each tile is made from 100% cotton, mould made, archival paper. Each paper has been researched and tested by us to best suit tangling needs. Each color invites a new set of tools and techniques that opens up endless tangling opportunities. 7∙7∙7 offers a little taste of each, so you can try them all today. Lucky 7's . . . Enjoy! We'll remind you on April 1 to mail you letter! We hardly can! It literally seems like just a few months ago, or maybe one year. It all remains so wonderfully exciting! 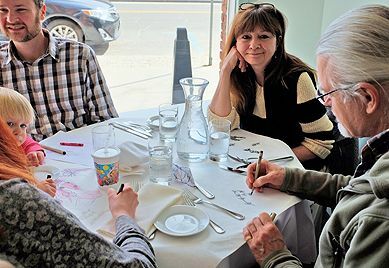 July 17, 2014, will be the Tenth (or is that "Zenth") Anniversary of our first public Zentangle class in Providence RI. 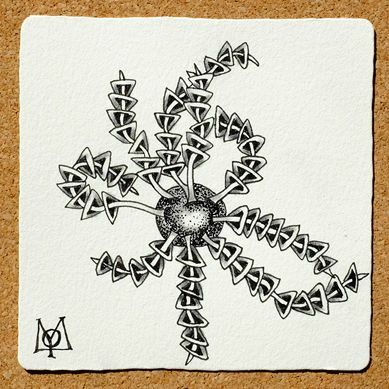 As we get a bit closer to that time, we'll be promoting the idea of "RAZs" or, Random Acts of Zentangle. 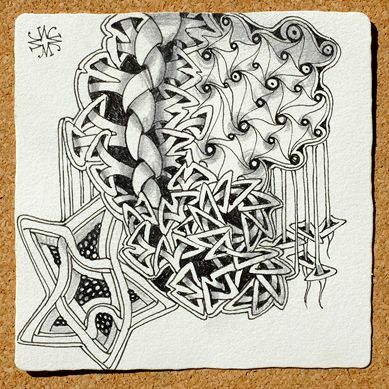 In other words, we'll be encouraging tanglers all over this wonderful planet to create a Zentangle tile or other Zentangle art and give it away. 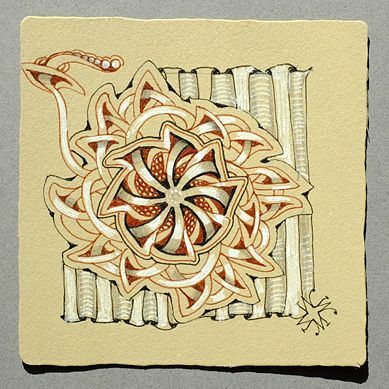 Maybe you'll give away many pieces; maybe you'll do it anonymously, maybe you'll do it with great fanfare; maybe you'll just hand a completed Zentangle tile to the next person you meet. We're looking forward to having a lot of fun with this and we'll have more to say as we get closer! Our "Treasure" Boxes are back in stock! The first set went quickly and we decided to reorder. Our plan is that this will be our final order and when these are gone, then we'll play with designing something else! Wishing you and yours a fun rest of 2014!